The "ozone hole" occurs over Antarctica in the very early spring when weather conditions and a lack of sunlight which produces ozone cause the stratospheric ozone layer in this region to become very thin (very little ozone). An atmospheric circulation pattern known as the "circumpolar vortex" builds over Antarctica in the winter, due to the very cold air mass that forms there. This vortex prevents stratospheric air from lower latitudes, which contains much more ozone, from penetrating into the atmosphere over Antarctica. At the same time, the long winter night deprives the air in the vortex of sunlight, which is necessary to produce stratospheric ozone. The result is that very low levels of ozone occur during September and October. 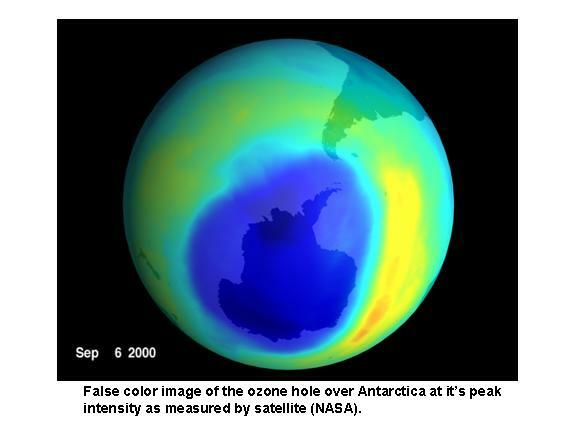 While this natural phenomenon was originally called the "Southern Anomaly", the term "ozone hole" has become more popular since it was discovered that some man-made gases called "chloroflurocarbons" can interact with and destroy ozone. This process is believed by many scientists to have caused the ozone levels over Antarctica, which were already low at this time of year, to virtually disappear in some years. This situation was considered by scientists to be more of an "early warning signal" than a present danger, since the lack of a protective layer of ozone over Antarctica at this time cannot do much damage, since there is little or no sunlight (and thus ultraviolet radiation from the sun) to cause harm to living things. A global thinning of the ozone layer, however, has been observed since the 1970's, and this could be harmful to some forms of life. An international treaty to stop the production of chloroflurocarbons (the Montreal Protocol) has since led to a reversal of ozone depletion, and ozone levels are expected to return to normal in the coming decades.